While Uccello was experimenting with perspective in Italy, over in the Netherlands Van Eyck was surpassing him. We’re looking into a room, we can see the depth of it, with the lines of the floorboards leading us into the picture. The mirror reflects the room back at us, and Van Eyck uses light and shade to create the illusion of the figures and the objects being in three dimensions. It is a domestic scene – it appears to be a moment of real life with these two people and the objects that they own that has been captured for us. A couple of other innovative features – it is a portrait, a new type of painting where individuals would commission a picture of themselves; and it’s the first we’ve seen today that uses oil paints rather than egg tempera. Oils dry more slowly and allow more subtle and deeper colours, and much greater detail; Van Eyck would build up thin layers of paint to distinguish the various textures and surfaces. On the woman’s green dress, you can virtually feel the weight and richness of the fabric, and on the dog you can see the individual hairs. So who are we looking at, and what does this represent? The man is an Italian merchant called Arnolfini who was living in Bruges. Various details in the painting show us that he was very rich: he is dressed in furs and expensive black clothes, there is glass in the windows, a mirror on the wall, amber prayer beads, oranges (a rare fruit in northern Europe) just lying on the window ledge. And two things that we would take as commonplace, but would have been big indicators of wealth – the carpet on the floor: in the 1400s these were generally hung on the walls like a tapestry, so having a carpet you walked on was real ostentatious wealth – and the bed: it’s huge and covered in lush fabrics. 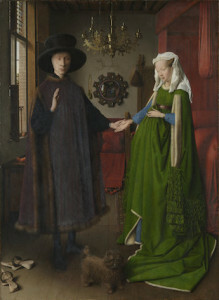 The painting used to be called the Arnolfini Marriage and was thought to be a sort of record of the marriage contract, even down to the way Van Eyck has signed the work– under the mirror it says Van Eyck was here 1434 – being like a witness’s signature. Another suggestion was that Arnolfini wanted to send the painting to his family in Italy to show how successful he was. But the latest theory is more poignant. We now think that the painting was done after Arnolfini’s wife had died, so this isn’t a celebration of the marriage, but a memorial to it. Some of the details provide circumstantial evidence for this. First, this isn’t the original frame, the original had two doors that closed over the image with the mirror in the middle – open the left door and you have life, on the right you have the memorial portrait. Look at the chandelier, above Arnolfini there is a lighted candle, they are all extinguished above his wife, and there are tiny images in the roundels of the mirror; on the left side they are to do with Christ’s life, and on the right with his death and resurrection. This entry was posted in five minute presentations, National Gallery and tagged arnolfini, art, van eyck on 16/03/2015 by donbrown.